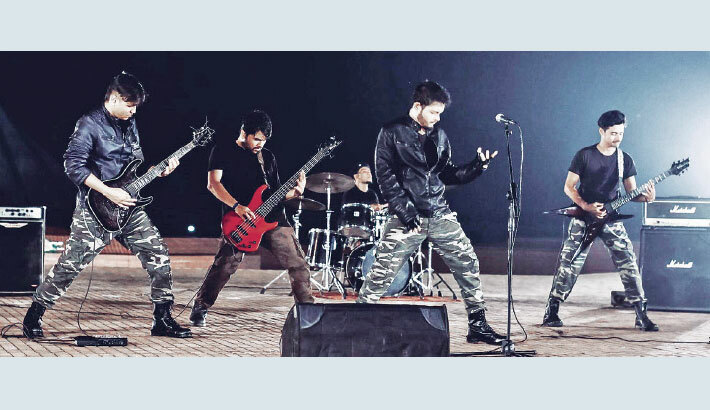 Band Arch’s music video “Bangladesh” is sure to awaken patriotic feelings treasured deep in the core of every Bangladeshi viewer. There is such power and intensity in this progressive rock band’s track which was only released last month that is sure to make our hearts swell with pride. The 4 minutes and 16 seconds song narrates the history of Bangladesh all the way from 3,000 years back that includes the 1971 Liberation War, 1952 Language Movement and even the dynasties from hundreds of years ago! Besides the lyrics being enriched in the glorious history of Bangladesh and the electrifying composition of the song, another attraction of the music video is the location. The band had staged themselves right in front of the National Martyrs’ Memorial (Jatiyo Sriti Shoudho) all throughout the music video that had further amplified the feelings of nationalism. In other words, every detail of the song and music video was purely ‘Bangladeshi’ from the core. The music video directors were Arjo Neel and S M Fazle Rabbi. It was mixed and mastered by Shafiq. The studio was Noizemine. Arch consisting of Showhardo Islam on vocals, Golam Robbani Shishir and Rakan Roy on guitars, Samir Sakir on drums, Sadab Nihal Shanto on bass and Tanvir Ahmed Jony as manager (press contact) had began their musical journey just a few years ago. Though the band started in 2012, they had some lime up changes. They began afresh in 2016 and got serious. As the band members added with humour, “Serious means really serious. We would hold weekly jams and anybody who is late would be penalized Tk. 100 (with which the rest of us would treat themselves! ).” Well, this strategy worked and the band members began to work on their debut album very soon with consistent practice. “We try to make the chorus really strong and melodic,” said Showhardo. “Of course we try to make the entire composition powerful but we try to give more priority to the song’s chorus.” Golam Robbani Shishir added that they would practice on and on, writing, tuning and scratching all that they wrote and giving a touch of perfection in all that they do. “Most of the lyrics of our songs are written by Imtiaz Reza Nizami. In the song Bangladesh, we were in a dilemma because we wanted to tell the stories of martyrs and of generations that have passed by in Bangladesh but we had only a few lines and even fewer seconds for them to be fitted in a song. Nobody would want to listen to a song that is fifteen minutes long!” Ultimately the final draft of ‘Bangladesh’ song was made and the band was ready to go. The entire song started from just one word that was ‘Bangladesh.’ As it came in the lips of one of them, the entire band began to start planning on it. With so many frowns raised even this day by some people in society on rock music and rock culture, these young musicians from Arch are showing how rock and metal music of contemporary times can also be directed towards something great.